he went and opened up his own brewery. Surgenor Brewing Company, the Comox Valley’s first craft microbrewery, began production this spring after months of anticipation from local quaffers. And while Bob the businessman takes the success of his namesake brewery very seriously, Bob the fun-lovin’ Canuck makes it very clear that Surgenor ain’t no suit-and-tie beer. “If Budweiser’s Hall and Oates then we’re probably Led Zeppelin,” says Surgenor with a mischievous grin. “A lot heavier and a little wilder! Perhaps a more appropriate, if less intriguing, story is the all-Canadian tale that weaves together hockey, a creative electrical company, Vancouver Island’s struggling forestry industry and, naturally, beer. It’s the story of how Surgenor Brewing Company came to be. About nine years ago, Bob Surgenor was running an electrical company (Surgenor Electrical Contracting Ltd., which he still heads) that depended a great deal on large contracts with sawmills and other forestry industry facilities. Unfortunately, around the same time, the forestry industry on Vancouver Island was in a bit of a tailspin and Surgenor increasingly found himself creating make-work projects for his employees. Although Surgenor had been toying with the idea of building his own sawmill—an idea that he admits would have been “a total disaster”—the inspiration for a brewery came as he and a few of his employees were building the aforementioned hockey rink. The idea was to keep his current staff busy working on electrical and mechanical jobs at the new brewery and at the same time— to borrow from his own analogy—turn down the Hall and Oates and crank up the Zeppelin. Construction of Surgenor’s $2.5 million, 465 square metre mid-life crisis began in July 2008, and on February 11, 2009 Surgenor Brewing Company was ready to begin production of its first batch of craft beer. The company held a soft opening at its Comox brewery on March 25, primarily as an opportunity to thank its many supporters. An official grand opening is still being planned, but Surgenor and his 12 employees have been so busy filling orders that they haven’t had a chance to nail down a date. With so much excitement in the Comox Valley around the opening of his brewery, Surgenor had to be sure that his products did not disappoint a community thirsty for a beer they could call their own. Leading the drive for quality is German brewmaster Martin Escbaumer, who left a prominent brewery in Munich to join the Surgenor team in June. A true master trained in the rich Bavarian beer-making tradition, Escbaumer’s expertise has already done huge things for Surgenor, whose previous Vancouver-bred brewer lacked such lofty credentials. Red House Ale, named after Surgenor’s striking red brewery, is a traditional Irish-style ale with a rich amber color and a full body. Its tasting notes describe it as “pleasant,” “thirst-quenching” and “deceptively complex.” Steam Donkey Lager, christened in tribute to the steam-powered winch used in the forestry industry before the advent of internal combustion, is significantly lighter but still has more body and much more complex flavors than traditional lagers. Steam Donkey Lager is a true working man’s beer, with a malty bite that goes down exceptionally well after a hard day’s work. While many qualities distinguish Surgenor’s products from others in the beer cooler —“glacier fresh” Comox Valley water, designer hops grown in the Pacific Northwest and a high content of flavorful specialty malts—none is more immediately apparent that its packaging. Amidst row upon row of boring brown bottles (Hall and Oates, anyone? ), a six-pack of Surgenor practically jumps off the shelf with its eye-catching aluminum bottles. Surgenor got the idea for using aluminum bottles from Pittsburgh’s Iron City Brewing Company, which experienced a renaissance in sales after introducing aluminum bottles in 2004. While presenting a fresh and visually appealing alternative on beer store shelves, the silver aluminum bottles cool beer more quickly when refrigerated (although once cold, claims that aluminum bottles keep beer cold longer are likely misled). They also present a much more eco-friendly alternative to glass bottles. Recycling aluminum bottles, on the other hand, requires only five per cent of the energy needed to fabricate a bottle from virgin aluminum. At the brewery itself, Surgenor’s aluminum bottles present yet another advantage. In the shadows of the towering stainless steel brewing tanks, hundreds of just-filled bottles are rattling along a conveyance system toward two employees who are packaging them for delivery. In most breweries, these employees would have to wear protective eyewear, and likely gloves, against the possibility of glass breakage. They’d also likely need earplugs against the deafening clang of glass on glass, and yet here at Surgenor the brewing floor is quiet enough to clearly hear the Led Zeppelin tune that’s belting over the radio (a pure coincidence, says Surgenor). In case we’re still not completely sold on aluminum bottles, Surgenor points out one additional selling feature—more beer. Each 355-millilitre bottle is weighed before leaving the brewery to ensure that it has been overfilled. Says Surgenor, the aluminum bottles are so lightweight that consumers would be skeptical that a true 355-ml fill actually contained the proper volume of beer. Once packaged, Surgenor and his staff take turns delivering the beer to customers throughout the Comox Valley and as far away as Duncan, Tofino and even Vancouver and the Gulf Islands. They hope to expand their reach all the way to Port Hardy, but because they distribute all of their beer personally the logistics will need to be worked out before expanding up Island. Self-distribution, however, does come with its advantages. “We’re sort of a unique anomaly,” says Surgenor. “There aren’t many of us like this that can self-distribute. You get better quality control over your product because it’s not sitting on a shelf or in the back corner of a warehouse re-fermenting. With personal delivery directly to his retail customers, Surgenor is able to ensure that his beer is always fresh when placed in front of the final customer. Of course, product freshness is never an issue when your beer is flying off the shelves as quickly as Surgenor’s is. The brewery has been producing approximately 8,000 bottles per day, plus about a third that volume (and rising) in keg sales despite a production capacity estimate of just 25,000 bottles per week. Plans are already being developed for the introduction of Surgenor Brewing Company’s third beer—a märzen. A traditional Bavarian-style lager, a märzen typically demonstrates a rich, amber color and a mild sweet malt character. All signs point to an optimistic future for the Valley’s first craft brewery and the pride of so many local beer drinkers. In fact, Surgenor admits that he was already thinking of expansion before construction of the brewery had even been completed, and he expects that his company will outgrow its current facility in a couple of years. Surgenor dreams of a new, high profile facility that would be a focal point for the Comox Valley. His ideal vision for a new brewery also incorporates a bustling market, something along the lines of Vancouver’s Granville Island, also the site of an increasingly popular brewery. For the time being, Valley residents can enjoy Surgenor’s Red House Ale and Steam Donkey Lager at more than 30 local restaurants and pubs, and bottles can be purchased at most local beer and wine stores. So what’s the best way to enjoy an ice-cold Surgenor beer? “Surgenor beer is good anytime,” responds Everson, a true public relations specialist. Bob the businessman appears to agree, until Bob the fun-lovin’ Canuck suddenly seizes control. and I felt at ease with Ric Rennison in command of the boat, as he skillfully guided the vessel across Baynes Bay to Tree Island. We did not follow a course “as the crow flies” because, according to Rennision, there are only a couple of channels you can navigate across without risk of running aground on a sand bar. My earlier research had revealed some of the history of this special place. The Department of National Defense used Tree Island for military exercises until 1966, when it was designated as Sandy Island Provincial Marine Park. Located about five nautical miles from the Comox Marina, Sandy/Tree Island is a 33-hectare island oasis. Although you can walk to Tree Island from Denman Island’s Longbeak Point at low tide, many Comox Valley residents have never stepped foot on its shores. Perhaps this is because if you don’t walk back to Denman before the tide rises, you’ll be spending far more time there than originally planned! Aside from that, the only other access to Tree/Sandy Island is by private boat or sea kayak. We arrived about noon to discover an exceptional expanse of smooth sandy beach. Several boats were already anchored just off shore—you need to use a smaller boat or zodiac to actually get to the beach—and a handful of people were picnicking, walking or splashing in the water. It was easy to see why they had come here. The beaches offer excellent swimming, beachcombing and sun tanning, as well as breathtaking mountain and valley vistas. The island is crowned with an abundant forest of mature trees, including arbutus, Douglas fir, blue elderberry and black Hawthorne, native crab and big-leaf maples. When we tired of the heat on the sandy beach, a stroll through these towering timbers soon cooled us down. Aside from the occasional overnight tent campers, there are no permanent residents. The Island’s human population is zero and there are no creature comforts. If nature calls, there are pit toilets and there is no running water. The shores of Tree Island are varied. Fine white sand, peppered with sand dollars and seashells, can be found on the Baynes Bay side. But walk across Tree Island, to the Seal Islets on the Georgia Strait side, and the pebbled beach is a frenzy of activity with tiny crabs and snails. At low tide, the tide pools are about ankle deep and as warm as bathwater. I was glad I had worn water shoes to be able to walk here, but other people—in sandals and sneakers—had to turn back. I used this time to myself to reminisce about the days when my children were young…. and how much they loved to explore tide pools when we went on family vacations. For a fleeting moment, I found myself wishing I had a small child with me… perhaps a grandchild… so I could share this amazing experience. I laugh out loud and realized that it must be time to get out of the sun. Ron, and I felt at ease with Ric Rennison in command of the boat, as he skillfully guided the vessel across Baynes Bay to Tree Island. We did not follow a course “as the crow flies” because, according to Rennision, there are only a couple of channels you can navigate across without risk of running aground on a sand bar. as he skillfully guided the vessel across Baynes Bay to Tree Island. We did not follow a course “as the crow flies” because, according to Rennision, there are only a couple of channels you can navigate across without risk of running aground on a sand bar. their pride in the Comox Valley is apparent. Rennison talks about “his” beautiful Vancouver Island and the waters of the Georgia Strait with as much pride and reverence as a preacher at a pulpit. And no wonder! He’s a fourth generation Islander and his memories and family history here go back almost 200 years. His ancestors moved here from England in the early 1800s and Rennison Road in Courtenay is named after his grandfather. Compared to Rennison, West is a newbie. She moved here from Alberta in 1984. Although she is well traveled, she is proud to call the Comox Valley home. Upon returning from a round-the-world trip in 2002, she says she felt a wave of pride as the airplane touched down at the Comox Airport. “It felt good to be ‘home’… to the most beautiful place in the world!” she recalls with a hint of nostalgia. Rennison had been employed in the logging industry for most of his adult life. In 2007, he made a career change when he purchased a 34-foot Double Eagle fishing boat and started a business called Adventure Marine Tours. He and his wife, Donna, redesigned the boat as a pleasure craft that could accommodate 10 passengers and a crew of two. They re-named the boat After Ours—a play on words to signify that they had raised their family and were looking forward to the next stage of their lives. After Ours is larger than many charter boats, boasting a fully enclosed cabin with seating, a washroom, a small kitchen, a covered deck and an open deck area. Its overall length and width, combined with the depth of its hull, make it more stable in open seas than similar, but smaller watercraft. “We spent the first year getting our feet wet—so to speak,” explains Rennison. “We began by offering whale and bear watching tours and fishing charters out of Kelsey Bay, which is about a 45 minute drive north of Campbell River. Then the economy tanked. We were struggling, as there was an oversupply of this type of charter in the Campbell River area. During the summer of 2008, the Rennisons realized that in order to succeed and make the business profitable, they needed a change of location and a change of focus. While Ric had many years of experience navigating the water, he recognized they were in unchartered waters when it came to other aspects of running the business. They knew they would benefit from adding someone with a financial background to the mix. So Rennison asked former business associate and chartered accountant, Jackie West, owner of Valley View Accounting in Courtenay, to come on board. Aside from their long-standing friendship, Rennison approached West because she is well versed in tourism from her previous world travels. This was a valuable asset to bring to the table. A new partnership was formed between the Rennisons and West. The company was incorporated and they sought out a new focus for its future. They spent most of the last eight months redefining the services that Adventure Marine Tours would offer for summer 2009 and beyond. They chose to relocate to the Comox Valley, not only because this is where their families live (so they could go home each night) but as importantly, because no similar service was currently operating out of the Comox Marina. In the spring 2009, they invited Reg Webber to join the team as a management consultant. Webber had been a client of West’s for the past 18 years and has known Ric Rennison even longer. The two men have worked together countless times over the past few decades. With many years of business management experience to his credit, Webber brought another valuable asset to company. With a new focus on eco-tourism and oceanic education, Adventure Marine Tours is now open for business. Rennison mans the boat; West makes the bookings and manages the finances; and Webber acts as tour guide and general manager. While you can still convince Rennison and Webber to take you out a fishing charter, Adventure Marine offers three new flagship excursions: A Taste of Hornby, Ocean Exploration—A Hands-on Experience and Tree Island Romance. There is a set cost for each excursion for guests age 15 and older; children between the ages of 7 to 14 are half price and kids under age six are free. In addition to the above-mentioned tours, Adventure Marine will also consider a ‘Create Your Own Adventure’ tour, whereby you dream up your own adventure and, if your dream is “doable”, you can charter the boat for $215 per hour, for a four-hour minimum for up to 10 people. A Taste of Hornby tour is an all-day event for $289.50 per person. Guests board the boat in the morning at the Comox Marina. After Ours is usually moored at the Gas & Go marine station at the south end of the marina, near the boat launch. The boat then travels down the coastline, then around Denman and Hornby Islands. During the 90-minute trip, Webber and Rennison tell stories about local landmarks, flora, fauna and sea life. The Ocean Exploration Tour ($198) is designed for people of all ages, but will be especially fun for kids enamored with nature. This six-hour tour leaves the Comox Marina and travels south to Baynes Sound to get a hands-on look at how oysters and scallops are farmed, as well as watch as prawn and crab traps are hauled up from the ocean floor. In addition to learning about what lies beneath the waters of the Georgia Strait, guests will also learn about the commercial fishing and logging industries and how they play an important role in the region’s past, present and future. Recognizing that there was also a niche to fill for a more romantic and relaxed ocean excursion, Adventure Marine Tours even planned something special for lovers… and others. The Tree Island Romance Tour ($235 per couple) takes guests from the Comox Marina to a special place the locals call “Tree Island,” but its official name is Sandy Island Provincial Marine Park. Guests looking for a romance rather than recreation are picked up at the Comox Marina and transported to Tree Island. They are supplied with a gourmet picnic supper and then dropped off on the beach for a few hours to enjoy some quiet time while they watch the spectacular sunset. For couples looking for something totally out-of-the-ordinary and hopelessly romantic, you can’t beat a rendezvous on an island oasis, complete with a sunset. Families looking to explore Tree Island get more enjoyment from arranging a morning drop-off, picnic lunch and early afternoon pick-up, rather than scheduling the sunset cruise. Recognizing the importance of doing only three or four tours, but doing them well, Adventure Marine Tours will spend this summer perfecting these three tours. But that isn’t stopping them from dreaming about what possibilities the future will hold. 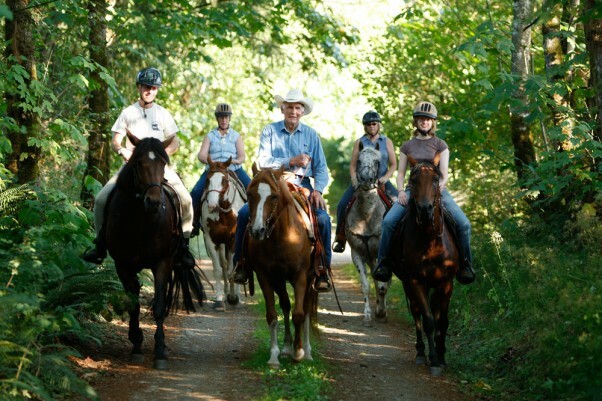 Several members of the Vancouver Island chapter of the Back Country Horsemen of British Columbia (BCH) enjoy a leisurely ride along One Spot Trail on a recent summer evening. The BCH played an integral role in the construction and completion of this historic project. when Langley, clinic BC equine enthusiast Jim McCrae embarked on a solo horseback ride of the 4,260-kilometre Pacific Crest Trail, he knew that it would be a life-changing experience. But he had no idea that his adventure would be a catalyst to change the lives of so many others, too.